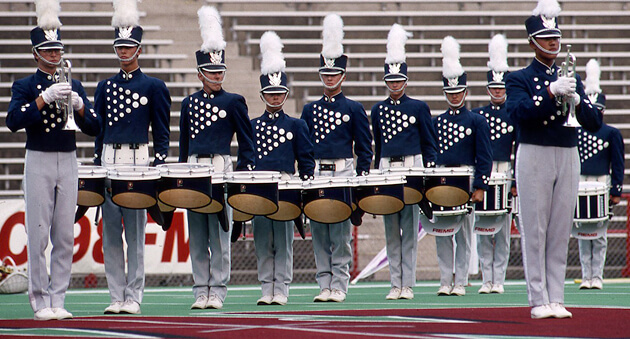 The Blue Knights take the field at the 1994 DCI Preview of Champions. The two-day competition took place at the University of Wisconsin's Camp Randall Stadium in Madison. Performing "Trttico for Brass Band," Blue Knights finished in seventh place in Madison, the same placement the corps found itself in three weeks later after tying the Crossmen at the DCI World Championship Finals in Foxboro, Mass. Foreshadowing the end of the summer season, the same 12 corps that were finalists at the Preview of Champions, were the same 12 that earned a spot in the Finals in Foxboro. 1994 marked just the fourth time the Blue Knights finished among the top-12 corps since attending the DCI World Championships regularly in the early 1980s. The corps has finished higher than seventh place just once since 1994, doing so with a sixth-place finish at the 2000 DCI Finals in Maryland. Scanning and archival services provided by Drum Corps International corporate partner WeScanFiles.com.